DUBAI, UAE, Oct. 2, 2017 /CNW/ - HE Saeed Mohammed Al Tayer, MD & CEO of DEWA, Founder and Chairman of the Water, Energy, Technology and Environment Exhibition (WETEX), announced the launch of the 19th WETEX (WETEX 2017). This announcement was made today during a press conference held at the Address Hotel, Dubai Mall, in the presence of DEWA's senior executives, representatives from partners, sponsors, and the media. "We are pleased to announce that WETEX 2017 will take place from 23 to 25 October 2017 at the Dubai International Convention and Exhibition Centre. Covering a surface area of over 70,000 square metres, the event will play host to 2,000 exhibitors from 50 different countries. This year, WETEX's theme is 'At the Forefront of Sustainability,' and is part of Green Week. It will also coincide with the 2nd Dubai Solar Show and the 4th World Green Economy Summit. At least 60 speakers from all over the world will focus on key topics, such as Smart Cities, Green Economy, Innovation, and Sustainable Development at this year's World Green Economy Summit," Al Tayer said. 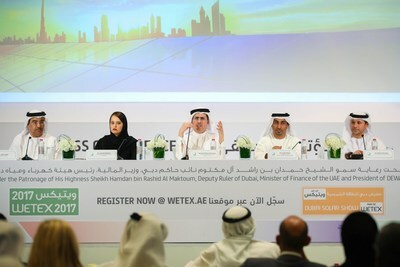 "WETEX 2017 has become an important strategic platform for the companies specialised in renewables from the region and all over the world, through which they can present their green solutions, products and technologies, and build solid business relationships with the world's decision makers and major investors in these fields," added Al Tayer. Al Tayer said that the organisation of the 2nd Dubai Solar Show, the biggest exhibition in the region focused on solar technologies, which coincides with WETEX, will take place over an area of 14,000 square metres. "We made it our priority to ensure that the 2nd Dubai Solar Show features a range of specialised platforms in addition to the national pavilions. The events agenda will include a number of high-profile discussions addressing key topics such as the regulations necessary for driving renewable energy projects, strategies of energy demand management, the Paris Agreement and the United Nations Framework Convention on Climate Change. Al Tayer thanked all the partners, valued strategic, platinum, gold and media sponsors for their support for this important economic and environmental event.